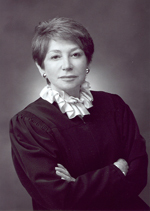 Frances Rothschild is the Presiding Justice of Division One of the Court of Appeal in the Second Appellate District. She grew up on a small family farm and worked her way through college and law school with the help of a scholarship and employment as a waitress, salesperson, and legal assistant. She graduated from UCLA, majoring in economics, and went on to UCLA Law School where she graduated with honors. She is married and has four children and five grandchildren. Justice Rothschild has a long history of public service. Her first job as a lawyer was a one-year stint as a research attorney for the very court she now serves as a Presiding Justice. Then, after practicing labor law, she became an attorney in the Office of General Counsel of the California State University and Colleges. She was appointed to the Los Angeles Municipal Court and three years later was elevated to the Superior Court. Over the many years she served on the Superior Court she worked in a variety of assignments including criminal and civil trials. Her responsibilities included a term as the supervising judge of a large Superior Court department. She was elected by her fellow judges to the Executive Committees of both the Municipal and the Superior courts. Most recently Governor Brown has elevated her to the position of Presiding Justice of Division One. Justice Rothschild has also served the community as a member of the Board of Directors of Vista Del Mar Child & Family Services, an organization devoted to providing treatment for emotionally disturbed children. She has been honored by the Los Angeles City Council and the Los Angeles County Board of Supervisors for outstanding service. She is an educator, author, and editorial consultant for legal treatises. As a member of both a United States special commission and a California gubernatorial task force, she worked with community representatives, including law enforcement, to improve the law. She has been an advisor on judicial education to the National Center for State Courts and the United States Department of Health and Human Services. She has served on various legal and judicial committees including the Executive Committee for Alternative Dispute Resolution of the Los Angeles County Bar Association and committees of the California Judicial Council and the National Association of Women Judges. On the Court of Appeal she has authored decisions on a broad range of legal issues and has continued her judicial committee work and involvement with judicial education.